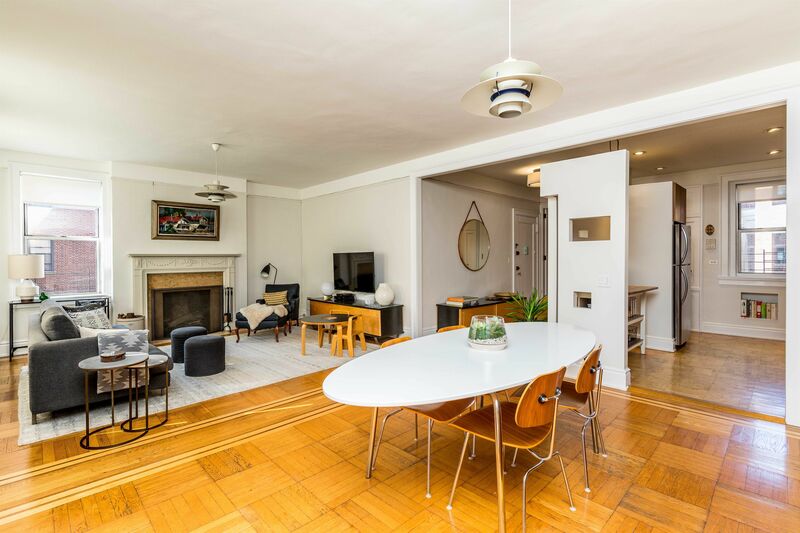 Modern design meets historic detail in this pre-war spacious two-bedroom, one-bathroom light drenched co-op in the much sought after landmarked section of Jackson Heights. 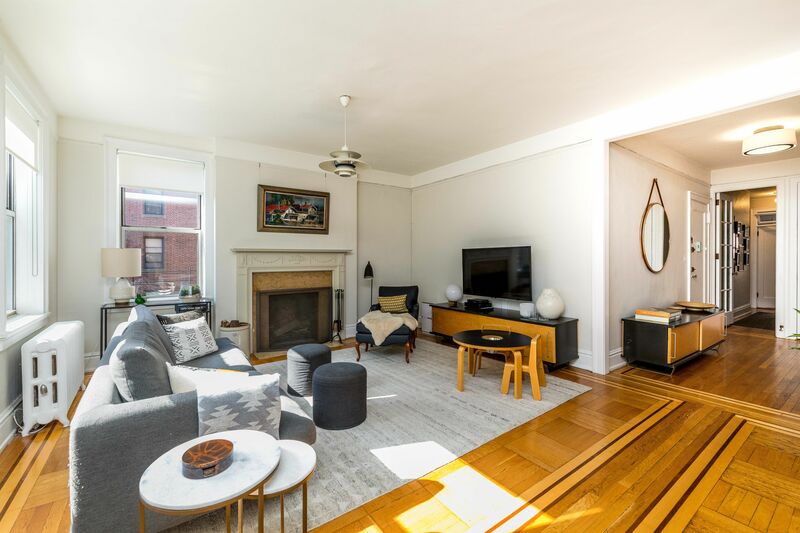 Thoughtfully designed by the owner architects, this apartment blends modern design esthetic while retaining historic original detailing. Designed with modern living in mind, this apartment features an open plan living room, dining room and kitchen. A gracious entryway with extra deep coat closet and architectural feature wall welcomes you in. Five huge windows in the living and dining area provide fantastic daylight from eastern and southern exposures. 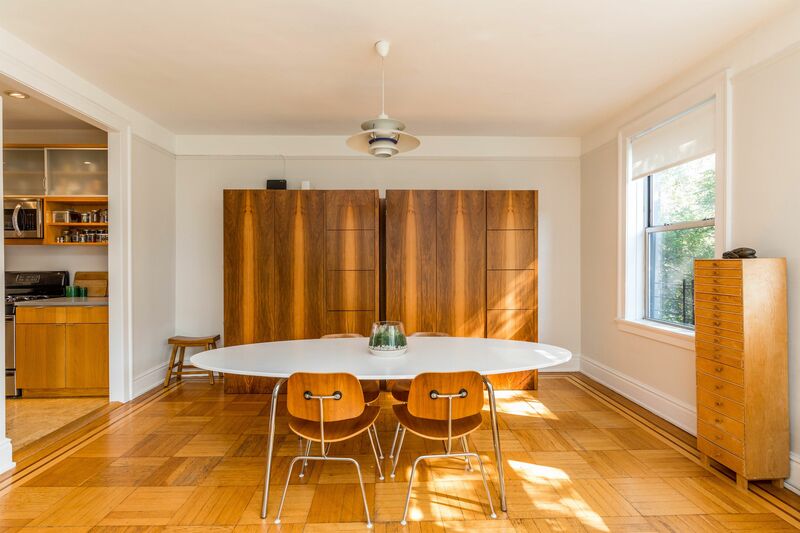 Oak parquet floors with mahogany and maple inlay are original. A working wood burning fireplace has a recently restored original mantel, original crema Valencia marble stone surround with mosaic marble crema Valencia and Carrera tile hearth. 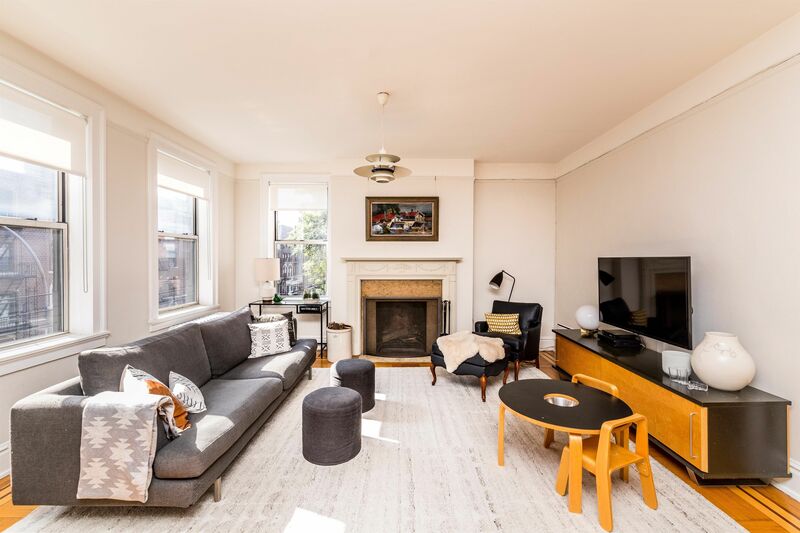 9 foot tall ceilings with original picture rail complete the airy light filled living and dining area. The custom designed kitchen is made with cooking in mind. The expertly planned design keeps everything at arm's reach with ample storage space, modern custom glass and open shelving upper cabinets, oak slab-front lower cabinets, built in pantry and broom closet along with flexible space that can be used either for additional storage or an eat in dining area. Newly installed quartz countertop is stain resistant and provides ample counter space. 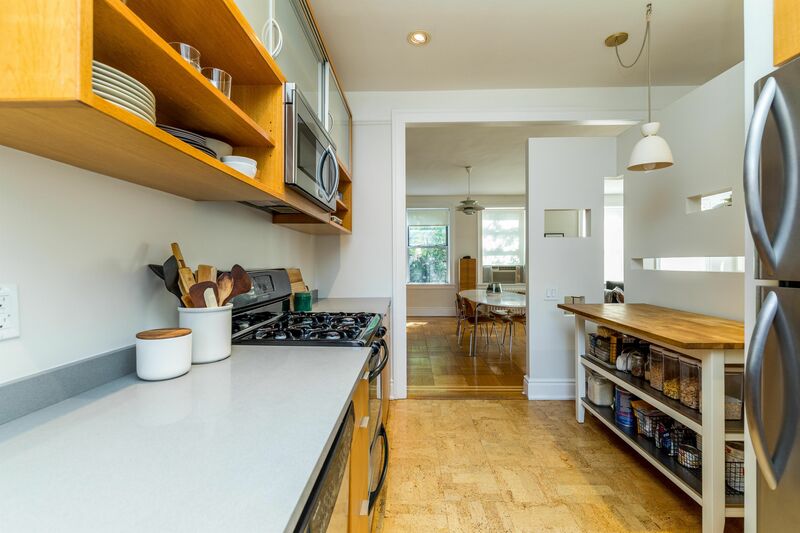 Stainless steel appliances, new stainless steel sink and chrome faucet are the durable backbone of this kitchen. The floor is cork tile, a natural sustainable material that is very comfortable to stand on while being extremely hardwearing. Oversized window with Western exposure floods the room with all day daylight and overlooks the rear garden. A cleverly designed feature wall surrounds the kitchen with Ronchamp styled cut outs which allows eastern and southern light in with whimsical modern adaptation. Pass through the original glass French door that leads you to the bathroom and ample sized bedrooms. 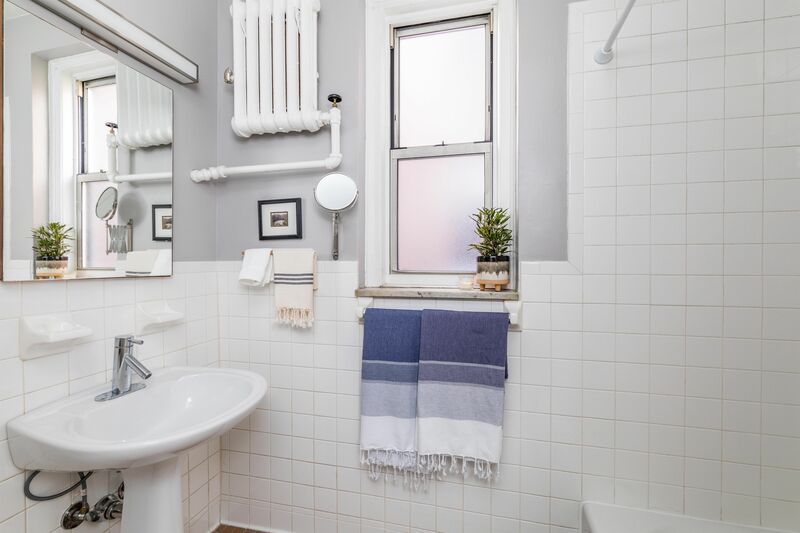 The bathroom has a nice size window, tub with shower, chrome fixtures and ceramic tile all in great condition. 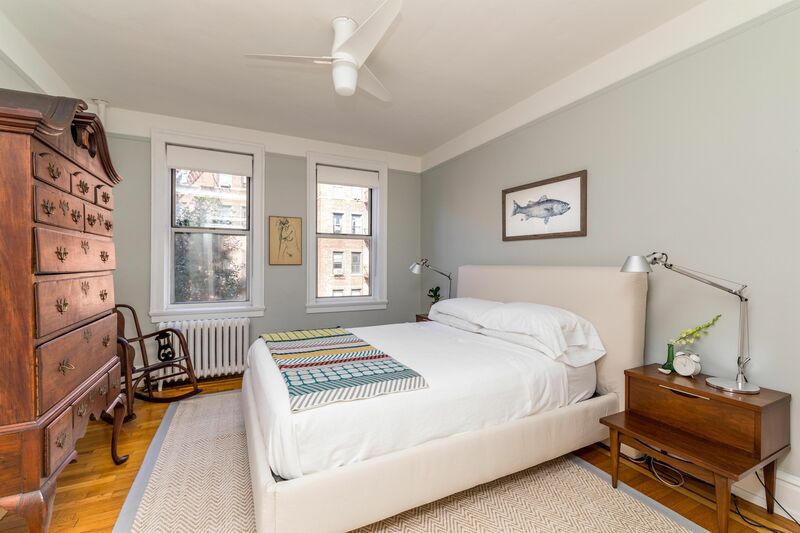 The bedrooms feature original oak flooring with mahogany and maple inlay, 9 foot ceilings, nice size closets and large windows with western exposures that flood the rooms with all day daylight and overlook the rear garden. 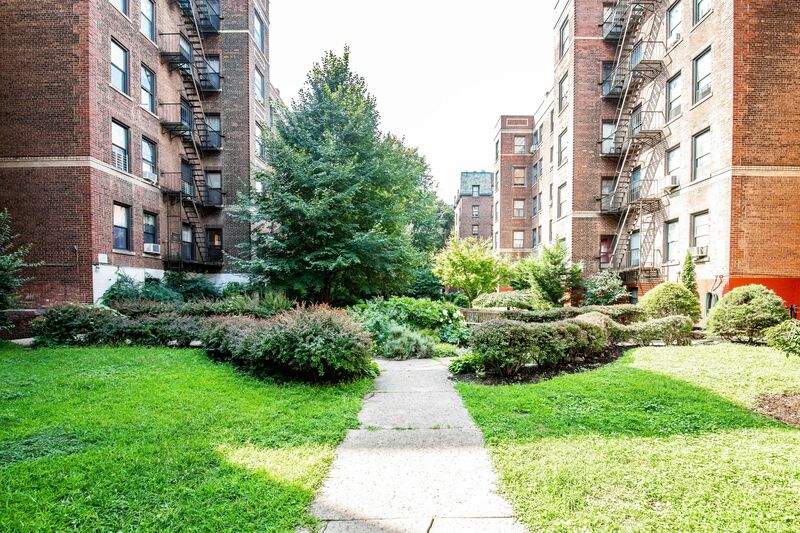 Laburnum Court is one of Jackson Heights' premier historically landmarked buildings. 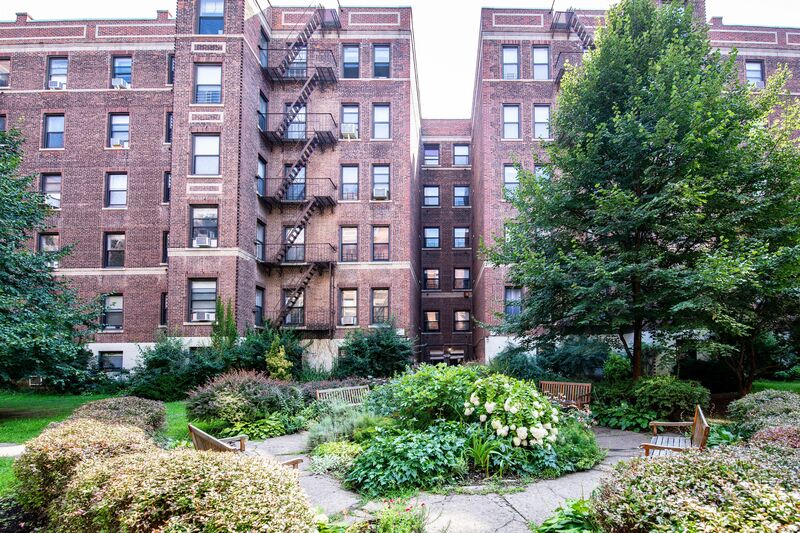 Built in the early 1920s by architect George H. Wells, this beautiful red brick and stone trim, neo-Georgian elevator cooperative features a lovely central landscaped garden and wood-burning fireplaces in every unit. 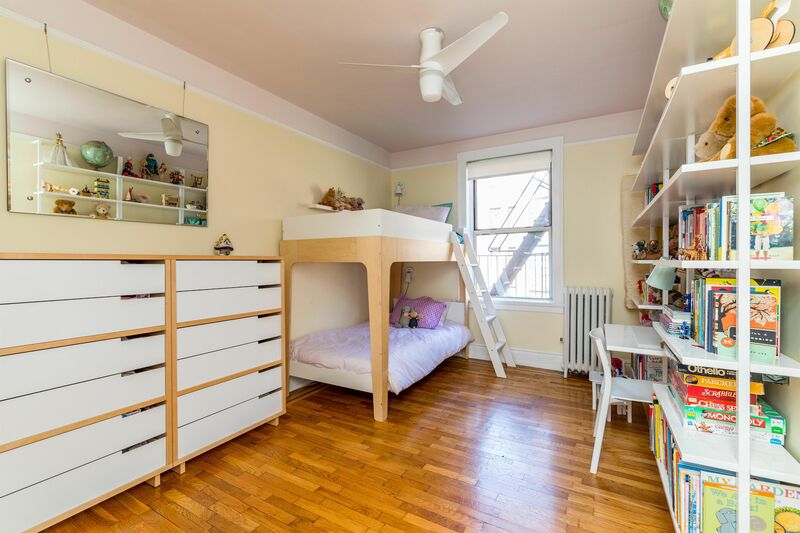 Laundry, bike and private storage (waiting list) are in the basement. Live-in superintendent. Cats are okay, no dogs. 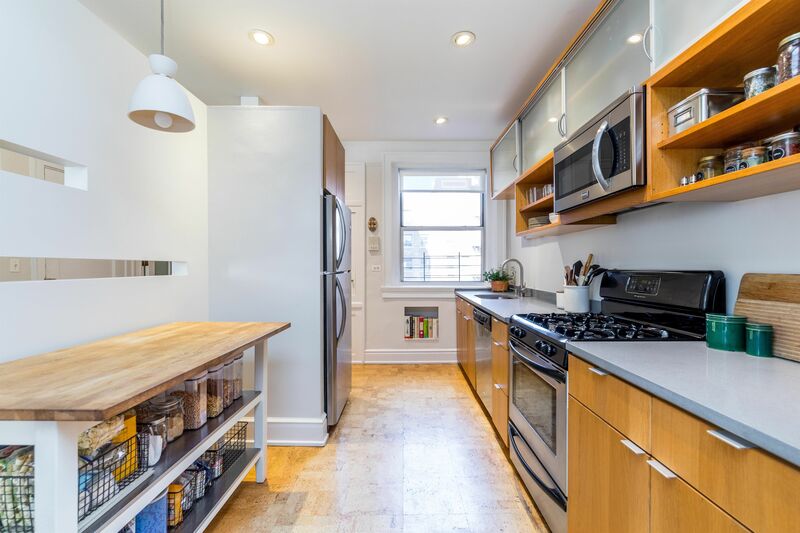 The building is moments away from the 37th Avenue shopping corridor and close to all trains including the 7 on 82nd Street as well as the E, F, M, R, 7 trains at 75th Street. 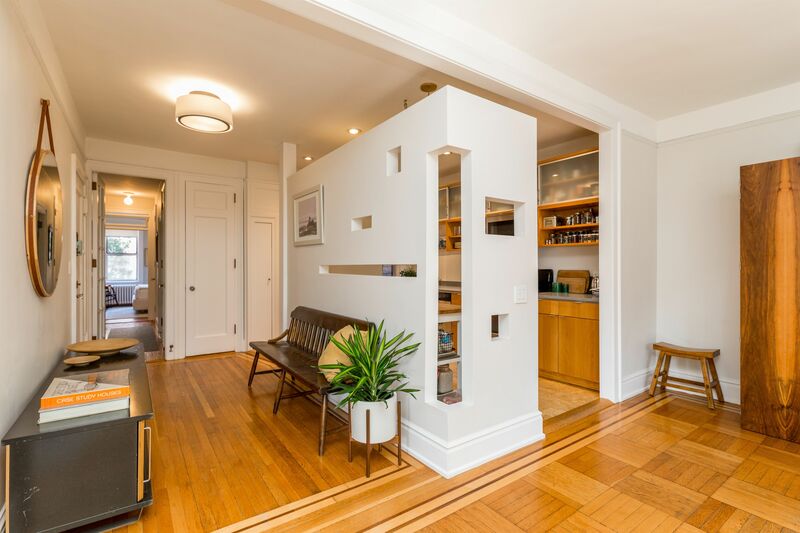 The most popular listings on Brownstoner this week include a Bed Stuy brownstone dripping with details, a concrete manse in the Hudson Valley and a modern revamp in Park Slope. Dreaming of cooler days ahead and curling up in front of an atmospheric fire? 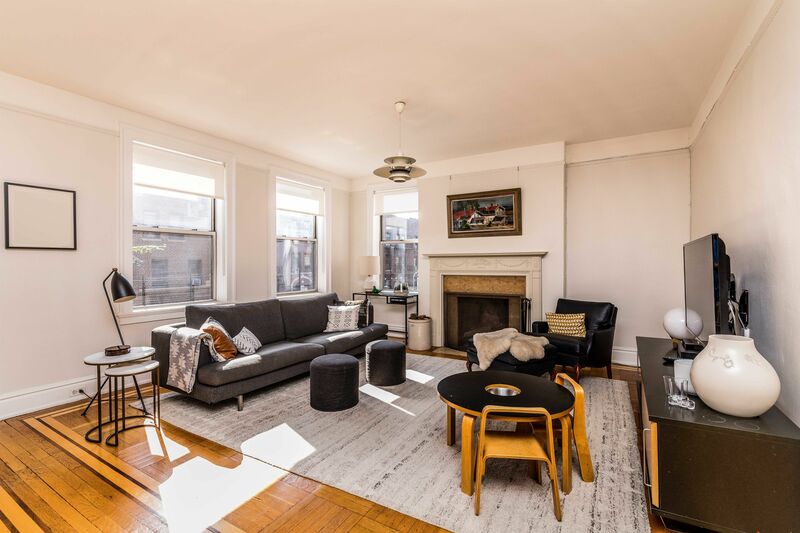 We’ve rounded up four apartments, all in Queens, that offer a bit of period charm along with working fireplaces.